Our thoughts and prayers go out to the victims and families of this immense tragedy. Our hearts go out to all the volunteers who put their own safety aside to assist those in need. Such a terrible event has struck our nation, but instead of tearing us apart, it has brought the United States closer together. We will seek justice, and we will find it. Please show your support and show our colors. In this site you'll find pages devoted solely to pictures of the F-15 Eagle and the F-22 Raptor. There is also a page with information on other fighter aircraft for you to contrast and compare. You can even vote on the aircraft to tell us which one you like the most. Here's a helpful hint for browsing our site. If you minimize the ad window, you can browse all of our pages without them popping up and getting in your way. If you close them completely, they'll keep coming back. 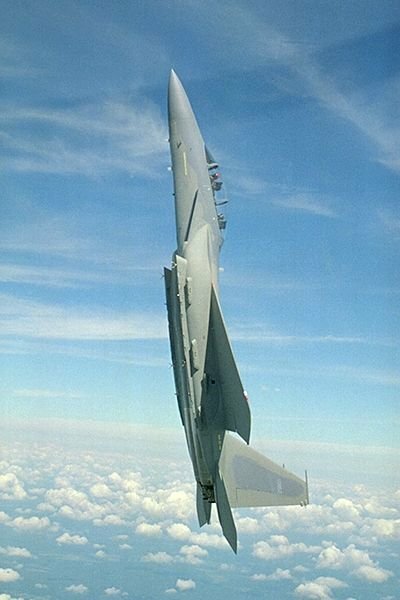 If you like this picture, please visit our F-15 picture gallery and fighter aircraft comparison page. If the picture does not show up, don't worry. Just click on another page in our site and come back. THE HANGAR is a non-profit organization. Please sign our guestbook and tell us what you think of our site. We apologize for those of you who signed our old guestbook. Our guestbook server is not responding and we decided to go with a better guestbook. Thank you.